Today's individual time trial from San Vigilio di Marebbe to Plan de Corones (Kronplatz) was quite particular. Not only the 12.9 kilometers were going up but 5.3 of them were sand roads. The maximum slope was no less than 24% for an average of 8.4%. Marco Frapporti (Colnago - CSF Inox) was the first rider to start this morning at 10.30AM and he realises the first time at 48'33". He was supported by no less than 100,000 people standing along the road in this climb. The riders started in three big blocks. 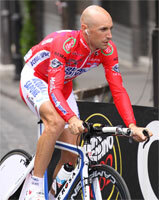 In the first block, the best time at the finish was realised by Damien Monier (Cofidis) with 44'15". At 12.50 the Estonian rider Kalle Kriit (Cofidis) was the first rider of the second block. In the second bloc, the best time was realised by Sylvester Szmyd (Liquigas-Doimo) with 43'40" before the start of the last block of 52 riders starting with Vasil Kiryienka (Caisse d'Epargne) at 3.10PM. In the mean time Branislau Samoilau (Quick Step), with 43'33", Rigoberto Uran (Caisse d'Epargne), with 43'04" and Stefano Garzelli with 41'28" improve the best time at the finish. The last one manages to stay on the first place and thus wins the stage with an average speed of 18.665 km/h. The last start was for the pink jersey, David Arroyo (Caisse d'Epargne), at 4.28OM. At the intermediate time point, the best time was realised by Cadel Evans (BMC Racing Team) at 21'11", 12 seconds faster than Garzelli. At the finish however, the Australian rider had lost 54 seconds on Garzelli to finish second at 42 seconds behind the Italian. The Formula 1 driver for Ferrari, Fernando Alonso, came to this time trial and got to follow Carlos Sastre (Cervélo TestTeam) on a motor. His support was not enough however for his compatriote to realise a good time because Sastre finished 1th at 2'31" behind Garzelli. Among the favourites he's thus the rider who loses the most time in this individual effort. (...) Now I'm going to take the stages day by day just like I did since the start ... we'll see what that can lead to. As a remidner: Gadret is currently 17th in the general classification at 21'07" from David Arroyo. 1/ Stefano Garzelli (Acqua & Sapone) - 41'28"
2/ Cadel Evans (BMC Racing Team) - +0'42"
3/ John Gadret (AG2R La Mondiale) - +0'54"
4/ Vincenzo Nibali (Liquigas-Doimo) - +1'01"
5/ Michele Scarponi (Androni Giocattoli-Diquigiovanni) - +1'07"
6/ Ivan Basso (Liquigas-Doimo) - +1'10"
7/ Rigoberto Uran (Caisse d'Epargne) - +1'36"
8/ Alexandre Vinokourov (Astana) - +1'37"
9/ Dario Cataldo (Quick Step) - +1'41"
10/ Evgeni Petrov (Katusha Team) - +1'46"
1/ David Arroyo (Caisse d'Epargne) - 68h32'26"
3/ Richie Porte (Team Saxo Bank) - +2'36"
5/ Carlos Sastre (Cervélo TestTeam) - +4'36"
8/ Michele Scarponi (Androni Giocattoli-Diquigiovanni) - +5'25"
9/ Robert Kiserlovski (Liquigas-Doimo) - +8'57"
10/ Damiano Cunego (Lampre-Farnese Vini) - +9'13"
1/ Richie Porte (Team Saxo Bank) - 68h35'02"
2/ Robert Kiserlovski (Liquigas-Doimo) - +6'21"
3/ Dario Cataldo (Quick Step) - +11'34"
5/ Valerio Agnoli (Liquigas-Doimo) - +22'38"